Read all about Customs Eye, a modular system that cleverly combines all kinds of modern technologies – thus contributing to high-quality, up-to-date supervision in the logistics chain. Dutch Customs is always looking for new ways of conducting its supervision and reducing the inspection burden for trade and industry. For this purpose the administration tests groundbreaking technologies, working methods and partnerships. For example, the service is currently looking into the possibilities of Customs Eye, a modular system that cleverly combines all kinds of modern technologies, thus contributing to high-quality, up-to-date supervision in the logistics chain. A dot on the horizon, which may be fast approaching. In the autumn of 2017, Dutch Customs experienced its biennial national Innovation Day. All nine regional offices presented a future scenario – a sketch of life in the year 2030. This included what the devisers saw as the most important and incisive changes in the areas of (geo)politics, economics, technology and logistics, plus an analysis of the impact of major alterations within the organisation. Each of them provided provocative horizons, which, on the one hand, mapped out possible bottlenecks for the service and, on the other hand, suggested possible solutions. The challenge then was to determine which of these options could be of use to Customs – in the future, but perhaps even now. Several of the suggested ideas appear useful in the long term; some even lend themselves to rapid development (which, however, does not imply that they can be applied within several years). One of them is a concept that received Customs Eye as its working title. It is about the smart integration of innovative and already available technologies. These technologies provide employees working within the field of physical supervision with all the necessary knowledge and information in real time in order to carry out smooth, effective and reliable onsite inspections (largely) independently – preferably from A to Z. And they enable them to handle these inspections administratively in the foreseeable future, and to link the result directly back to both the organisation and the customer, being the company responsible for the goods in question. Ideally all these functionalities come together in one handy device. With a little imagination, the physical supervision process of Customs could, in a while, present itself as follows. 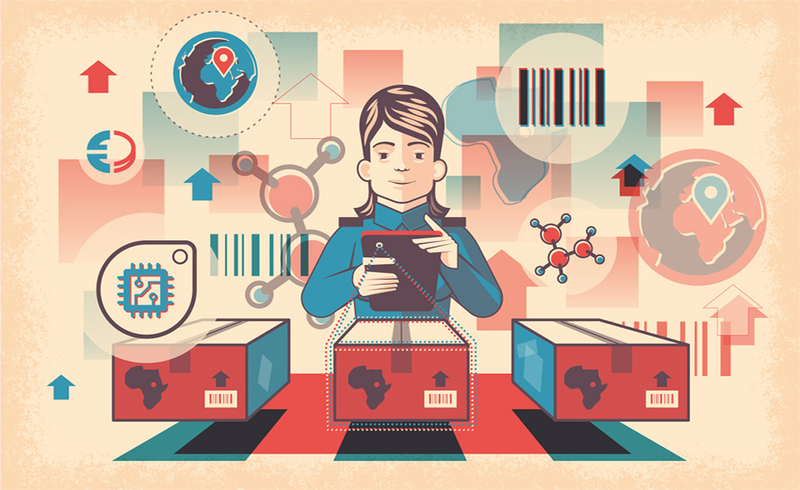 On the basis of information and risk-based selection, the Customs Control Room sends a supervisory official to a company – let us say a parcel service. Once there, this employee logs into Customs Eye using biometric identification. He opens his audit assignment and focuses on the goods consignment designated for inspection. He uses his tablet or smartphone to photograph or film the (re)packaging and reads the labels on it, as well as any smart tags. He uses the built-in 3D camera, barcode scanner and NFC reader for this. The recorded information is then compared with data from the central databases of Customs and all sorts of other files. Within a few seconds, the audit officer sees everything he needs to know about the article in question on his screen: the origin, the chemical composition, the CN code, the tariff classification, etcetera. At the same time, an assessment is being made as to whether all this corresponds with what is stated in the declaration. If the importer, for instance, submitted false declarations in the past, this will also be mentioned; 3D images of the previously incorrectly indicated products will be included. If there are any doubts about the correctness of the collected data and the contents of the packages, the audit officer may proceed to carry out a further inspection of the goods. His device is equipped with so-called sniffer sensors, which are detection and measuring instruments to see what is inside packages without actually opening them. But he also has access to integrated analysis equipment for simple chemical research. If required, it will provide him with information about the ingredients of the product in question, and thus solid grounds for a final assessment. Whatever the outcome of the audit is – compliant or non-compliant – the result is quickly and easily passed on to relevant customs departments for further processing. A report then simultaneously goes to the customer via a secure portal. Should he have to pay an additional tax or penalty, he is thus then almost immediately informed thereof. If the goods are allowed to pass, they can be released immediately. There is virtually no delay here. The course of events described above differs considerably in a number of respects from the current situation. The main difference lies in the fact that the self-reliance of the customs officer increases enormously within the field of physical supervision. His knowledge and information position will be reinforced, as he has direct and instant access to a very wide range of data sources, anytime, anywhere. And, to a certain extent, he can now carry out chemical analyses of goods himself. His dependence on the ‘second line’ will therefore reduce; he less likely needs to fall back on colleagues from the Customs Laboratory, among others. That back-up, which will always continue to be needed to a certain extent, can easily be facilitated within Customs Eye. After all, it does not seem difficult to add to such a modular entity a video link, for example, between employees in the field and specialists elsewhere in the organisation, for remote support. Obviously, there will always be the possibility to take product samples in complex cases and to offer them to the laboratory for analysis, perhaps even to a satellite laboratory nearby. All in all, customs supervision will focus more and more on the actual location of inspection, and will more and more take place in the moment. As far as information transfer is concerned, Customs Eye is a two-way street: audit officers use their findings to feed the databases of Customs. This creates a huge reservoir of relevant facts about all kinds of products, transport routes, individual market parties and entire logistics chains, among others. Managed centrally, properly classified and easily accessible – to those who are authorised. This not only serves to benefit the physical supervision, but other customs processes, such as client management and the declarations department, stand to gain just as much. All these data help the service identify trends, tendencies and developments, and further refine its risk weighting and risk selection. In other words: to make other, increasingly better-informed choices in its control process. Ideal for a learning organisation such as Customs. In this regard, Customs Eye continuously provides the service with up-to-date administrative information about the usefulness and effect of its actions. This makes it easy to explain certain policy decisions to, for example, covenant partners and commissioning departments. An extended version of Customs Eye as outlined here does not seem to be anything for the near future. Still, the delivery of less comprehensive variants may be surprisingly nearby. Customs recently devised such a form, with a limited number of building blocks: an application that supports mobile working for audit officers when inspecting postal and courier shipments for illegal medicinal products. This app, which as yet only exists on paper, is already expected to achieve numerous advantages. For instance, customs officers would have to send in considerably fewer product samples to the lab during the course of operation. Furthermore, findings could be recorded quickly, easily and uniformly, and could be widely shared. With covenant partner IGJ*, for example, which should always be able to keep track of the results of inspections on medicines. Great prospects, that leave us wanting more.